Sir Vince Cable has announced he will step down as Liberal Democrat leader after May's English local elections. Sir Vince said he wanted to pave the way for a "new generation". He became party leader without a contest after Tim Farron's resignation in 2017 - but the party has struggled to make an impact in the polls since. The former business secretary said in September he would stand down as party leader "once Brexit is resolved or stopped". But in an interview with the Daily Mail, he said: "It now looks as if it will be a protracted process, and may never happen." Sir Vince was a leading figure in the Lib Dem/Conservative coalition government before being ejected as an MP in the 2015 general election, when his party lost most of their 57 MPs. He returned to Parliament in 2017 as MP for Twickenham and took on the job of leading the party's 12 MPs, which recently went down to 11 when one of them quit to vote for Theresa May's Brexit deal. 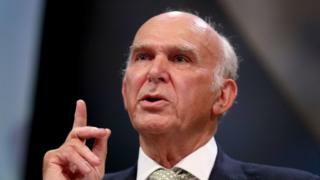 Under Sir Vince's leadership, the Lib Dems led calls for another EU referendum as a means of stopping Brexit - and joined forces with pro-referendum campaigners in other parties in the People's Vote campaign. But despite some gains in local elections and a claimed increase in membership, the party struggled to get out of single figures in the opinion polls. In an interview with the BBC's Newsnight, he conceded that the Independent Group of MPs, who have broken away from Labour and the Conservatives as a new "centrist" force, had taken media attention away from his party. But he added: "We have made a lot of steady progress after two very difficult general elections." And he said he welcomed the formation of the Independent group, which he said had the potential to become a major political movement. Last autumn, he announced plans to transform the party's fortunes by opening up the leadership to non-party members. Anti-Brexit campaigner Gina Miller addressed the Lib Dem annual conference - earning a better reception than many of its MPs - but she declined to join its ranks. In a statement, Sir Vince said: "I indicated last year that once the Brexit story had moved on, and we had fought this year's crucial local elections in 9,000 seats across England, it would be time for me to make way for a new generation. "I set considerable store by having an orderly, business-like, succession unlike the power struggles in the other parties." He said he would ask the party to begin a leadership contest in May. He added: "It has been my great privilege to lead the Liberal Democrats at this crucial time. "I inherited the leadership after two difficult and disappointing general elections. But I take pride in seeing the party recovering strongly, with last year's local election results the best in 15 years, record membership and a central role in the People's Vote campaign." Deputy leader Jo Swinson - who declined to stand for the leadership in 2017 due to family commitments - will be seen as a frontrunner to replace him. Ms Swinson tweeted: "It has been an honour to work with Vince for a more open, liberal & tolerant Britain. He has helped LibDems through challenges of last two years & led us to some of our best local election results in a decade - and I'm confident we'll celebrate another strong set of wins in May." Layla Moran, another MP who has been talked about as a possible leadership contender, tweeted: "Vince Cable I want you to know how grateful I am for all you've done. Thank you so much for your service to the Party and Brexit." Does your dinner come from a ?? ?dark kitchen??? ?